The AP has an informative update on the U.S. Marine efforts in Now Zad. Marines on the front lines in southern Afghanistan say there’s no question that the militants are just as deadly as the Iraqi insurgents they once fought in Iraq’s Anbar Province. The Afghan enemy is proving to be a smaller, but smarter opponent, taking full advantage of the country’s craggy and enveloping terrain in eluding and then striking at U.S troops. Taking advantage of the Afghanistan’s mountainous rural landscape, the fighters often spread out their numbers, hiding in fields and planting bombs on roads, rather than taking aim at U.S. forces from snipers’ nests in urban settings, as often was the case in Iraq. And they are not as bent on suicide, often retreating to fight another day. “One thing about Afghanistan, they’re not trying to go to paradise,” said Sgt. Robert Warren, 26, of Peshtigo, Wis. He served a tour in both Iraq and Afghanistan before his current assignment at Combat Outpost Sharp, a Marines camp hidden in cornfields and dirt piles. Marine commanders believe they face between 7,000 and 11,000 Taliban fighters in Afghanistan, although it is unclear how many are low-level militants hired for battle as opposed to extremist leaders. Both foes are also sometimes known to use drugs — troops have reported finding syringes and needles in enemy camps. In Anbar the insurgency was bifurcated between the indigenous fighters and the foreign elements who fought for religious reasons. In Fallujah in 2007 fighters from Chechnya, Somalia, and other countries were killed by the 2/6 Marines. They were found to have been taking epinephrine and morphine before engagements. It’s a positive development that although the indigenous fighters are disciplined, they aren’t fanatics. They only work for people who are fanatics. Scores of them might still have to be killed in order to convince them that a few dollars isn’t worth the risk. But the situation is not good for the Marines. Recall that we have had this debate about rules of engagement and the fact that the Marines cannot possibly be assured in these cases that there aren’t noncombatants inside structures. Thus, not only would the 2008 Marine Corps operations in Garmsir not have occurred, but the Taliban will learn to seek refuge in structures very quickly in these engagements. It was a simple observation but for some reason difficult for others to understand. “You can’t shoot back because you don’t know if there are civilians there.” And thus the warfare ends and the game begins. I suspect that it will be a deadly game for the noncombatants and Marines alike, regardless of the intent of the rules. I have been loath to weigh in on the issue of torture, waterboarding, the intelligence gleaned from such methods, and in general the whole issue of detainees in the war on terror. I feel that there are too many people weighing in who don’t know enough information to be useful, and I don’t need to add to that number. Regarding waterboarding I must rely on friends of mine who have undergone the procedure in SERE training. One friend in particular informs me that it is terrifying, but in his opinion, not torture. As those who go through SERE training know, you spend some time doing not only that, but also spend some time in a 55 gallon barrel. But as my friend also informs me, “I would tell them anything they wanted to hear in order to stop the process.” So the question naturally arises as to the usefulness of the procedure and whether actionable intelligence is really gleaned. But we can add to this knowledge with the experience of Khalid Sheik Mohammed. “During the harshest period of my interrogation I gave a lot of false information in order to satisfy what I believed the interrogators wished to hear in order to make the ill-treatment stop. I later told interrogators that their methods were stupid and counterproductive. I’m sure that the false information I was forced to invent in order to make the ill-treatment stop wasted a lot of their time,” he said. So we have learned that on the most significant targets in the history of using this method it caused poor information to be gleaned at first, but much more significant information to be gleaned later due to a change in attitude. It was the change in attitude that was important. Whatever an individual decides concerning the issue of specific procedures, I still believe that far too many people now know far too much about U.S. black operations. Bill Clinton eviscerated the CIA human intelligence capabilities, and Obama is finishing the job. Obama intended from the beginning to target the CIA with investigations. Leon Panetta, who is said to be opposed to certain CIA programs in which high value targets are assassinated, is making matters worse. In fact, the damage may have already been done and the situation made irreversible. Whatever else one might conclude about the state of the CIA and the unecessary public investigations, they are effecting a disembowelment of the very intelligence agency that is supposed to protect American interests. And it appears to be all by design. Quite an ugly exchange took place a few days over the issue of women in infantry (note, not women in the military, but women in infantry) . But many may still harbor the notion – or believe the myth – that it’s all about social mores. My detractor is not a Marine infantryman, and neither am I. So I decided to go right to an authority on the issue and discuss this with a certain Marine infantryman whom I know that has spent a lot of time in the field, earning the combat action ribbon in Iraq. I expected a visceral reaction, and to my surprise I got much more of a reflective, studied response than I bargained for, at least initially. The initial thoughts concerned the Navy Corpsmen and the sorts of things they treat for Marines on a daily basis when Marines are in the field for 28 days and don’t shower. A whole host of different diseases and different logistical concerns would exist for women than for men. But we won’t rehearse the balance of that part of the discussion – it was far too personal. Other issues were brought up. The very long discussion eventually shifted to a number of physical issues. It went something like this (this is a condensed summary statement of what I heard; there was much more than included below). “Look. Whoever said this is a pogue and has never been in the field. Yes, it’s about the 120+ temperatures – it’s almost impossible to operate. 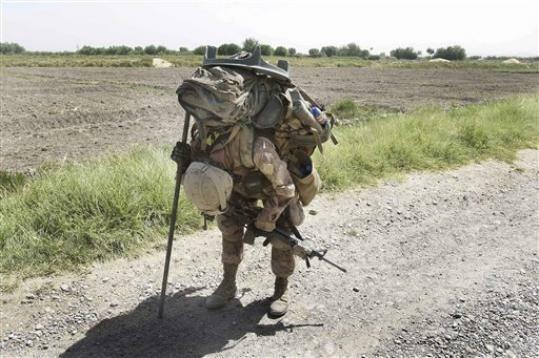 Yes, it’s about the heavy body armor, and in full gear with backpack, hydration, weapon and ammunition, it’s more than 120 pounds for as long as the hump, 15 or 20 miles. But it’s really about more than that. It’s even more than about the ability to carry heavy weight for long distances in high temperatures. We don’t bathe for a month at a time. If we are doing MCMAP quals, we beat the hell out of each other, continually – every day, all of the time. Literally. Men beat the hell out of men, and get it back too. Remember when I was in Fallujah and I had to jump off of the roof of the house? I was under fire, my unit was leaving and I had to catch the HMMWV, and I had on full body armor with hydration, SAW drums and SAW. And I had to jump from the roof of a house to the ground. I have had to tackle men in Fallujah who were assaulting us. Full grown men, attacking us by hand. Football style tackle with holds and moves on the dude while in full body armor. Remember when I trained the SAW gunners before ___________? I would make them hit the road for a four or five mile run in the morning, full armor, to the range. Range all day, then four or five miles back. Screw PTs. Can you run and live all day in full armor? You want to know what it’s like, physically, to be an infantry Marine in the field? Strap 120 pounds on your body and play men’s football for a season, and do it while being sleep deprived with guys dropping around you from heat stroke. Do squad rushes with full weight. And when you hit the ground, don’t pretend. Hit the ground. So there you have it. The case is closed for The Captain’s Journal because an authority has spoken on the issue. Omar at Iraq The Model had previously observed that Iran’s IRG was most likely behind the recent bombing attacks in Baghdad (or so it was reported by Azzaman). Mohammed updates us with news that Maliki is blaming the Syrian administration for the attacks, and is demanding that certain Ba’athists be handed over to Iraq. He further speculates that Maliki is going after Syria as the weakest link in the trouble-makers in the region as a straw man. I had initially suspected not the Ba’athists, nor AQI, but Iran and the IRG or perhaps the Quds. I believe that AQ is essentially dead in Iraq. But this doesn’t mean that the Sunni insurgency is dead. The New York Times has a happy report on lake Habbaniya being enjoyed by Sunni and Shi’a alike, but a more clear headed assessment is given to us by Jane Arraf through the Council on Foreign Relations, entitled Reappraising U.S. Withdrawal from Iraqi Cities. When you talk to Iraqi officials, they believe this is a fight for survival. The Shiite-led government believes that there are Baathists who want to topple them. There are Iraqi officials who firmly believe that there are military people, former Baathists, who want to launch a coup. And that doesn’t make the Sunnis feel very secure, particularly since we’ve seen things like the governor of Baghdad, Salah Abdel-Razzaq, saying that they might arrest some Sunni members of parliament in connection with these bombings. That creates a huge division. Iraqi and U.S. officials always say the key to stability is reconciliation, and by that they mostly mean reconcilitation by the Maliki government [Prime Minister Nouri al-Maliki] with the Sunni groups including, former insurgents and the Sunni political parties. In the aftermath of the bombings, it’s hard to see where they go from here with all the accusations that have been thrown around. And then there are Iraq’s relations with its neighbors. Over the weekend, the governor of Baghdad said Saudi Arabia was behind this. The interior ministry released a taped confession which may or may not have actually been a confession from someone who says that Syria was involved in this. That doesn’t really bode well for Iraq’s relations with neighboring countries. And we have to draw a difference there between the government and the foreign ministry. The foreign minister, who is Kurdish, actually has very good personal relations with the Saudis. But the Saudis hate Prime Minister Nouri al-Maliki and they hate the Shiite-led government. Iraq is a really complicated place to begin with but this attack, and its repercussions, could really threaten stability. There is no question that the recent bombing, along with the sectarian behavior and ineptitude of the ISF, causes the Maliki administration to look weak and unable to ensure security. She then goes on to discuss the issue of the withdrawal of U.S. troops from the Iraqi cities. There’s a very delicate dynamic right now. The whole idea was that after June 30, the United States would step down from security in the towns and cities. There wouldn’t be combat troops in the street and it would truly be an Iraqi show. And it’s happened perhaps to a faster extent than even the U.S. commanders would have envisioned. I was in Ramadi and Anbar Province and the local Iraqi police wanted the Marines to help, but decisions to ask for U.S. help had to be made by the Anbar operations command, which is an arm of the operations apparatus attached to the prime ministry. It has not made a single request for help from the Marines since June 30 and that’s the case in a lot of these towns. Which was all well and good up until last Wednesday. Those bombings indicated to a lot of people that we have to stop pretending that things are fine and that applies to the U.S. commanders as well. One Iraqi senior official told me literally that they can’t pretend that everything’s fine as they engage in a responsible drawdown. Because in some cases, Iraqi security cannot handle it. They don’t have the intelligence capability. They don’t have the technology to detect explosives. But the discussion doesn’t drive to the root of the issue with whether the Marines could ever again perform combat operations in the Anbar Province. On the occasions that Marine bases in Anbar take rocket attacks, the first reaction is to call Iraqi Police. The Status of Forces Agreement has the Marines’ hands tied. At the security meeting this week, Marine officers reminded their Iraqi counterparts that US forces were available to help with intelligence and surveillance, biometrics to identify suspects, and defusing explosives. The security agreement, which requires the Marines to give the Iraqis 72 hours notice to move outside their base and then only with Iraqi escorts, has left part of the battalion with so little to do that more than 500 Marines are being sent home early. While looking inept, the Maliki administration has “bet the farm” on the readiness of the ISF, virtually ensuring that the U.S. forces do not contribute to the future stability of Iraq. This bet might prove to have been a bad one, and regardless of being in the minority, if the Sunnis feel that they haven’t been included in the power sharing, there will be trouble. While the Sunnis still must be addressed, it is clear that Iran has not been. The Marines will leave Anbar, and very soon. They will not be back inside the cities or anywhere else for that matter, nor should they be under the current SOFA. Any future participation in the affairs of Iraq by the Marines should be under a revised SOFA that gives them the latitude to close with and destroy the enemy, project force, and ensure their own protection.